"The Synthetic Sigmax Duo contains two of our best-selling brushes (F82, F84) with classic black matte handles. The brushes in this collection feature our exclusive Sigmax filament, which allows flawless makeup application without absorption into the fibers. The F82 brush is perfect to apply liquid and cream foundation and mineral powder. The F84 brush can be used to apply cream and regular blush. 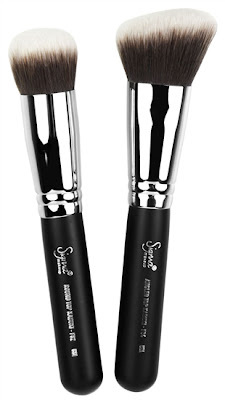 This brush is also great for contouring and highlighting the face." This Duo will be selling off at RM95.00 including postage. Grab them in a pair to save RM39.00! I like to purchase the stigma f82 and F84. Please inquire and/or place your order via the Order Form. We'll get back to you soonest, thanks.